Other than the tacky wallpaper, and the horrible kitchen, the fireplace mantel was one of the first projects I wanted to take on when I moved to my current home 5 years ago. I’m still not sure exactly why it bothered me so much, the old mantel was pretty standard stuff, but even so, I knew it wasn’t going to be long before I got the project started. Sure enough, within my first year here I got itchy and cut in. I heard that my then employer, Upland Brewing Company, (yeah! craft beer!) had some extra barn beams leftover from a reno project. It didn’t take me long to get over there and stamp my name on one. 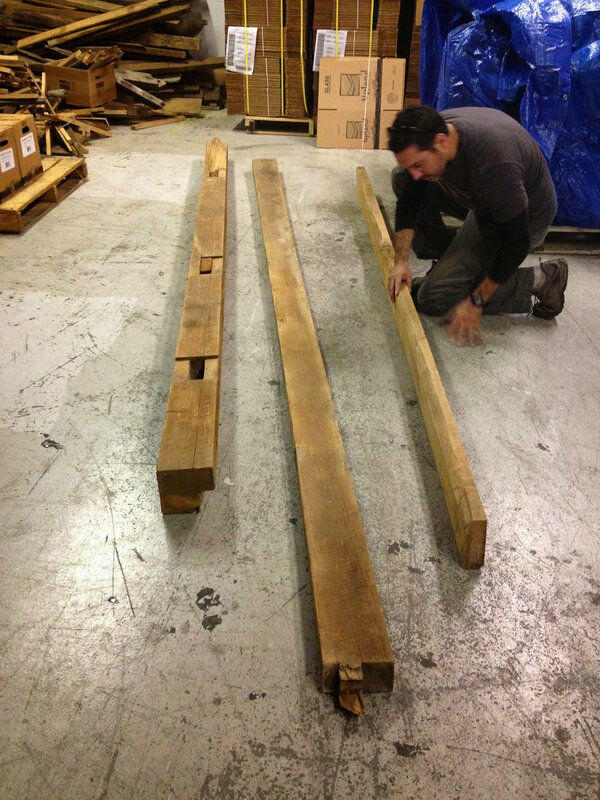 Here’s my buddy Pete picking out a beam for his fireplace as well. He chose a leaner beam, I went for the chunky one on the left. My hubs and Pete hauled the beams over to Pete’s place where they were cut to length. 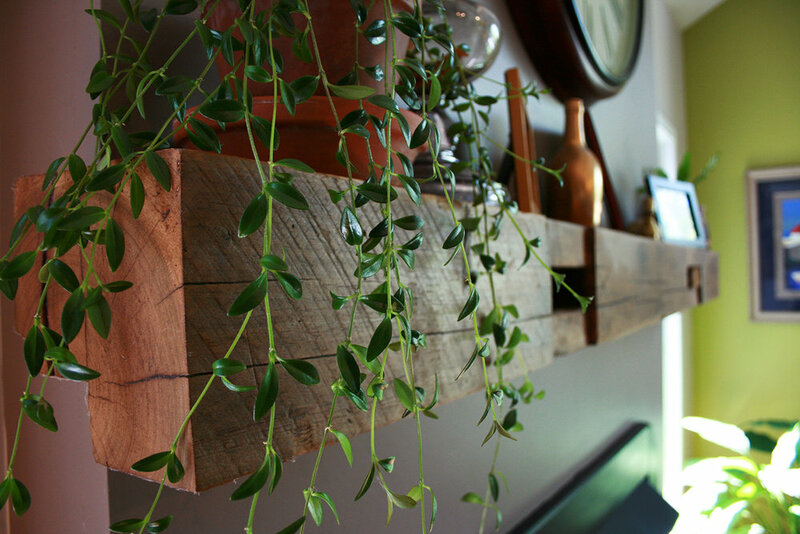 I wanted my mantel to be slightly longer than the wall, peaking out on each side just a bit. The mantel we inherited looked puny and way to small for the space. After I was convinced the beam was just the right size, I went at it with a band sander. I didn’t want to sand it too much, the beam had a lovely patina from age and wear. I used a medium grade sand paper and made sure all the rough spots were sanded out and then went back over with a fine paper to make it smooth as butter! I had to spend some extra time on the ends which were fresh cuts. 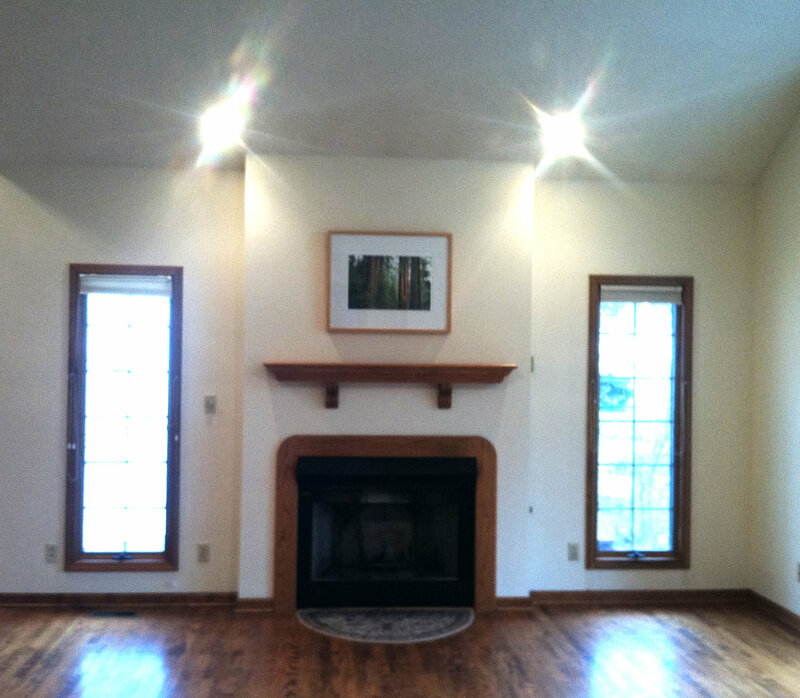 When the beam was well sanded and ready for install we drove long lag bolts into the wall studs and married up the bolts with deep drill holes in the back of the mantel. This was the moment of truth. 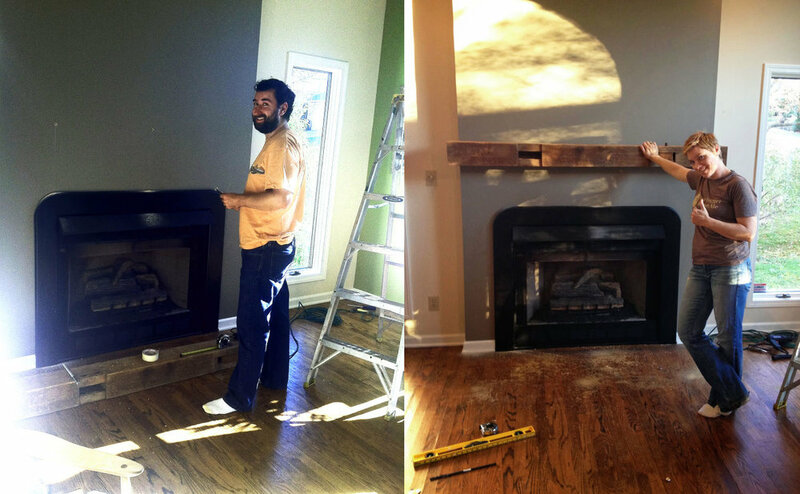 We lifted up the mantel, aligned the holes with the bolts and pushed that beam into the wall. We needed to use a rubber headed mallet to get it all the way in. Check me and my man out… we’re so pleased! 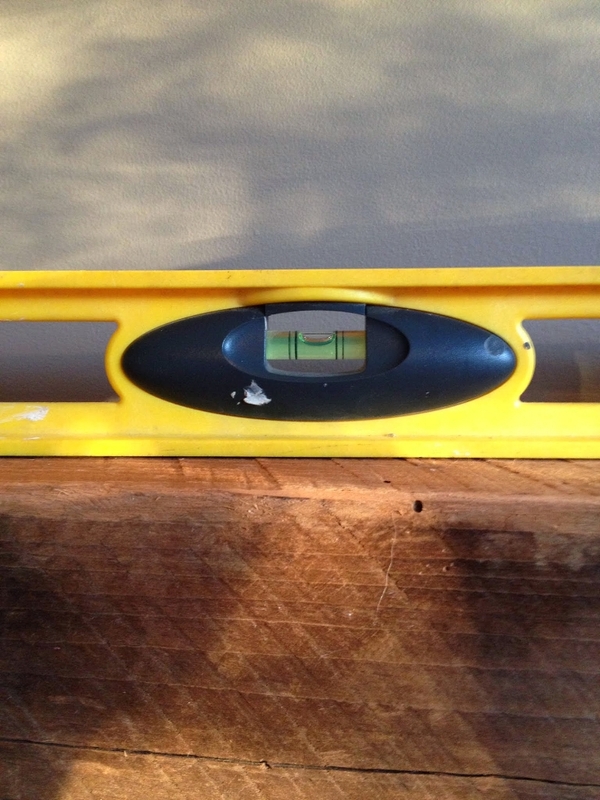 Now the moment of truth….. is it level?? OH YEAH BABY! Turns out the precision work we did preparing was just right and the beam set just how we wanted it to. After I was assured the mantel was well installed and sturdy enough to carry my weight (yes, I did hang from it like chimpanzee), I gave the ends a light coat of a rubbing stain to match the color of the rest of the weathered beam. In stages, and as it dried, I also rubbed in a mix of mineral oil and furniture wax to seal in the beauty. Nice and natural. Here’s the before and after. As you can also see we painted all the woodwork in the house, all white with the exception of the fireplace surround which we painted black. I also converted the fireplace from a gas log to wood burning. Nothing like a fire!